US President Barack Obama visited a whisky maker for the first time this week during his trip to Cleveland for a speech to the City Club of Cleveland. He visited the small business incubator that’s home to Tom Lix’s Cleveland Whiskey, along with nearly two dozen other small manufacturers. Lix’s proprietary — and controversial — process takes young whiskey and gives it what Lix claims is the color, aroma, and taste of older Bourbons. 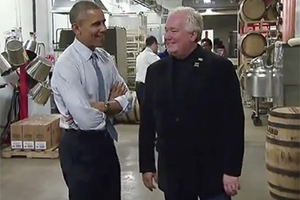 He’ll tell us about the President’s visit and discuss his process on this week’s WhiskyCast In-Depth. In the news, the investigation into the theft of whiskey from a Wild Turkey warehouse in Kentucky continues, Jim Beam fights back in the courts, another “world” whisky is named the World’s Best Single Malt, and a Japanese CEO has banned his executives from drinking some of his company’s own whiskies to make more available for consumers.